European leaders will meet in Brussels on Monday to discuss the escalation of demolitions by Israeli authorities of Palestinian homes and humanitarian aid in the West Bank. Despite six months of diplomatic talks between the EU and Israel, the rate of demolitions in the West Bank has spiraled, violating international humanitarian law. Oxfam has witnessed first-hand the devastating impacts of these illegal demolitions on the lives and livelihoods of Palestinian men, women and children. 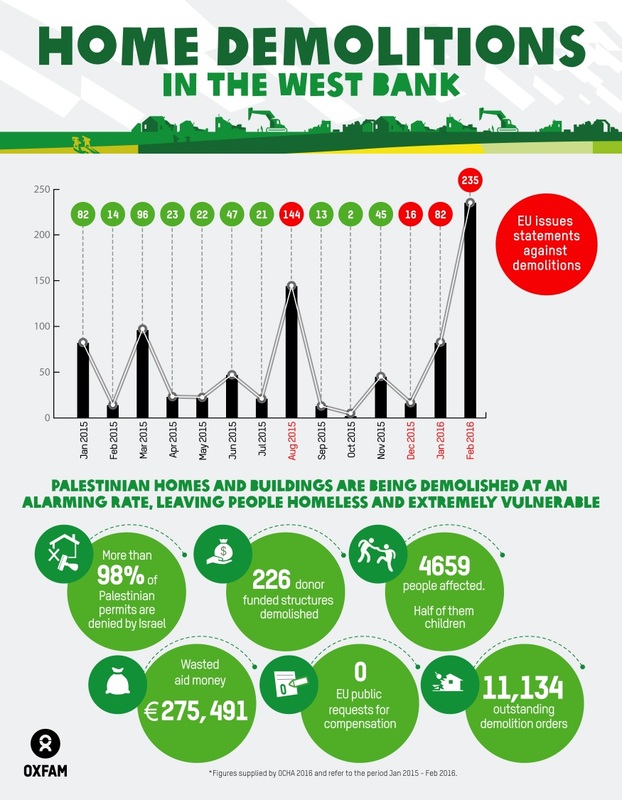 Oxfam calls upon European governments to live up to their commitments and to start protesting and requesting compensation for the destruction by Israeli authorities of Palestinian homes and the confiscation of humanitarian aid in the West Bank.